THE EPO must be a big fan of false information (misinformation). It does, after all, spread false information all the time. It does it literally every single day (except most weekends, due to inactivity). It does this both internally (inwards, to staff) and externally (outwards, to users, journalists and so on). This was rather surprising, so tracing it back to the source we found that it’s just fake news, fake headline and misinformation from Bristows, as usual (fabricators and liars). They lie about the UPC in order to make it sound imminent and inevitable. They try to tell that to politicians as well, in order for them to vote/act out of ignorance. What utter nonsense. What. Utter. Nonsense. This deviates so widely from any realistic timetable. Expectedly, Bristows staff at IP Kat (surrogate to Bristows’ much-neglected ‘blog’) decided to start amplifying other UPC boosters such as Alex Robinson. Alan Johnson’s colleague copy-pasted something from Robinson, adding a misleading headline to it all. “They lie about the UPC in order to make it sound imminent and inevitable. 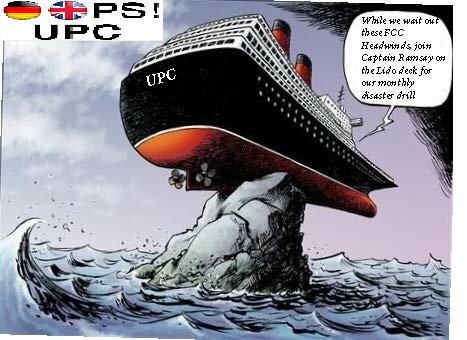 They try to tell that to politicians as well, in order for them to vote/act out of ignorance.”“I wrote a thing about the #upc’s passage through the Commons,” he said, “and the @Ipkat kindly published it” (if it’s pro-UPC, then of course it will!). But watch the lobbying disguised as news/analysis — the very reasons some people resigned from that site. The headline (title) is “UK House of Commons committee progresses final stages of UPC ratification” and it then says that “in a room somewhere in Westminster, Kat friend Alex Robinson (Dehns) was observing the latest goings-ons on the Unified Patent Court with respect to the UK’s ratification process.” Barely even matches the title. Where are those “final stages of UPC ratification” and why the positivity/certainty? Nothing in Robinson’s words justifies it. As usual, as is common at IP Kat, what we have in posts is UPC propaganda followed by negative comments (those which pass moderation anyway), often berating the author. Just bypass Team UPC and see comments (as usual, the comments there are a lot more informative than the lobbying/marketing they’re attached to or clustered around). Put another way, Jo Johnson knows that they are not in a position to do anything, and not just due to Brexit talks. Reading Hansard, it seems that that Jo Johnson used certain phrases repeatedly. This is unlikely to be an accident. More likely, those phrases were drummed into him beforehand so that he could stay “on message”. One of JJ’s most repeated phrases was that the government wanted to be “in a position to ratify the agreement”. If this repetition is indeed the result of JJ effectively reading from a pre-agreed script, then it is not hard to reach the conclusion that the UK may not rush to deposit its instrument of ratification. In connection with the UK’s future participation in the UPC, other phrases often repeated (in a number of variations) could well be significant too. These include “we will need to negotiate” and “It would not be appropriate for me to set out unilaterally what the UK’s position will be in advance of those negotiations”. So, to conclude: whilst reaffirming that it thinks that the UPC is a good idea, the UK government has promised neither swift ratification nor a guarantee of the UK’s continued participation in the UPC… as everything seems to depend upon the outcome of negotiations with the EU. As we all know, the UK has stated its intention to leave both the single market and the customs union, and to ditch all Treaties that underpin EU law, including TEU, TFEU and EURATOM. How on earth the UK can do this and continue participating in the UPC is anyone’s guess. Indeed, one could be forgiven for gaining the impression that the government is desperately trying to keep all plates spinning for the time being whilst knowing full well that it will be impossible to keep this up indefinitely. This all means that, instead of asking when the UK will ratify, we ought instead to be asking which of the plates currently spinning will the government allow to come crashing down: the UK’s position on the single market (and the role of the CJEU) or the UK’s position on post-Brexit participation in the UPC? Whilst I do not know the answer to that question, I most certainly would not like to put money on the UK’s continued participation in the UPC. And this perhaps raises the most pertinent question of all: even if it were able to ratify the UPC in 2018, do we really believe that the German government will do so without knowing whether chaos will reign less than a year later as a result of the UK’s enforced departure from the system? Wearily, I suppose this JJ wordplay is all of a piece with the notion that negotiating with EU 27 is all about having in your hand more “cards” to play that the Team on the other side of the negotiating table. Presumably, the view amongst HMG’s ministers is that one of Macron/Merkel’s highest priorities is to get the UPC up and running, and further, that EU27 ready to pay a high price for UK ratification. A bargaining chip in whose favour? The UPC would be a curse — not a gift — to Britain. Signatures in the petition suggest so too. Weber had promoted the UPC, but he recently (only days ago) implicitly acknowledged that the UPC is pretty much dead.